888 Bingo has Play 75 and 90-ball games at 888 Bingo. Plenty of bingo rooms on offer, plus a selection of games. The mobile site is very bright with its purple and blue colour scheme. A bingo site for UK players run by a trusted gambling operator. 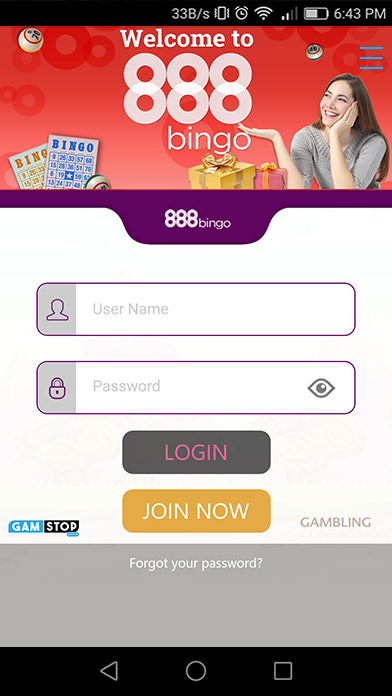 888 Bingo has 500% welcome bonus is on offer when you sign up and deposit £10. Enjoy cashback and other rewards as you collect loyalty points on site. Win thousands of pounds in prizes that are up for grabs to players daily. 888 Bingo is a mighty confusing site. It’s not that it’s competing against a plethora of other gambling sites called 888 – it is, but that’s not the issue. The confusion starts the moment you visit www.888bingo.com and are presented with a pop-up asking you if you meant to visit 888ladies.com. The short answer to that is “No, if I did I’d have entered 888ladies.com into my browser”. Presumably the pop-up is triggered by session cookies that try to guess the gender of the visitor to the site – wrongly in this case. But, why can’t ladies play at 888 Bingo in any case? It seems a tad stereotypical to assume that the only place they’ll feel at home is on the pinker than pink 888ladies.com. Regardless of your gender and colour preferences, when you banish the popup and land on 888 Bingo’s homepage proper, you’ll be greeted by a clean blue site with a logo that’s very reminiscent of the Co-op logo. The promotions across bingo sites tend to be cut from the same cloth. As there is usually only one game to play, the deposit bonus is where the best value exists. At 888 Bingo, you are met with a 500% Welcome Bonus on your first deposit of $10. Yes, you read that right: if you deposit $10, you will be able to play with $60! Now, to be able to withdraw any of that money, you will have to play through the bonus 4 times, but it does give you 6 times the opportunities to become a big winner.